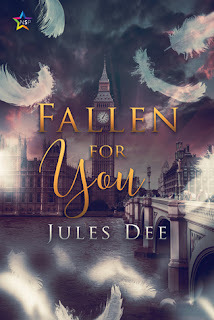 Today I welcome Jules Dee to the blog to share new MM PNR release Fallen for You. When you work with someone for years, you think you know them pretty well. Casey Wicker and Martin Bishop are a British Secret Service team with a reputation for ignoring rules but delivering results. They’ve also built a tight friendship, with more than a spark of unspoken attraction. While on assignment to Scotland Yard, Martin rescues Casey and exposes him to a life-changing secret. Martin is not what he seems, and now that Casey is aware of that, the knowledge most likely comes with a death sentence. When a way to avoid the tragic ending is suggested, it may very well take more cooperation than anyone is willing to expend. “You’re utter rubbish at this, you know that, right?” Casey shouted as Martin’s long legs ate up the distance ahead of them, arms and shoulders bunching and rolling in graceful synchronicity. They stood close together, heads almost level, breathing hard and grinning in spite of the danger as the sounds of angry shouting faded in the distance. “We got the document we were after, didn’t we? I don’t see the problem.” Martin’s eyes sparkled bright blue even in the dimly lit recess as he ran a hand quickly through his short dark hair. Casey smiled at the familiar habit that tended to appear when in risky situations. Jules Dee doesn’t understand what she has done to deserve her magnificent life. She is surrounded and supported by her husband and her friends. Her cats appreciate that her habit of writing creates long hours of lap-time, which they are happy to consume and repay her with purrs. When she isn’t writing, she spends her days running the Technology Service Desk for a Local Council in Metropolitan Melbourne and fixing things that are broken.